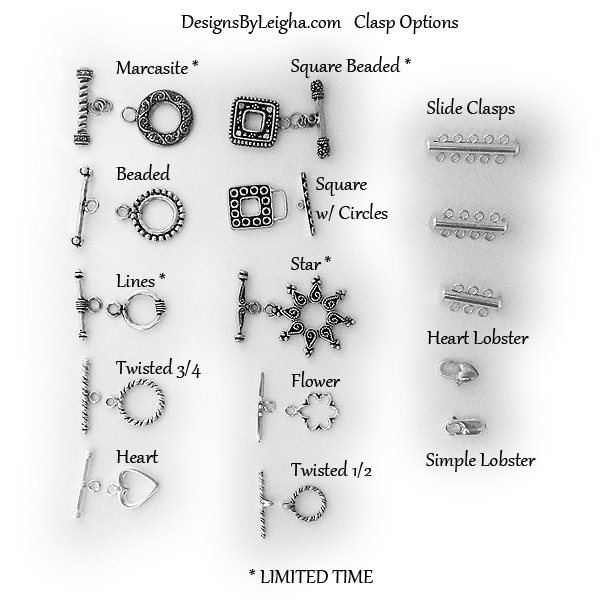 Most of the time you have clasp options during the ordering process. Sometimes I only list a few that I think will look best with that bracelet. However, if you have a favorite toggle or lobster clasp I would be happy to substitute it for you. Please email or call me before, during or IMMEDIATELY after you place your order to let me know which clasp you prefer, if it isn't listed. STERLING SILVER: My silver toggles, slides and lobsters are all .925 sterling silver. GOLD: My gold toggles and lobsters are 14k gold plated. I have a simple gold lobster and a gold twisted toggle. Toggle clasps are generally easier to put on and take off. Lobster clasps are less likely to unintentionally come off but hard for older adults with arthritis. Note: I recommend slides claps on bracelets that have 3 or more strings. If you choose the slide the bracelet will lay prettier (I think) on your wrist because each string will lay beautifully next to the others. * Limited quantity/time. There are a few NEW toggles that I am trying for a limited time, to see their popularity.